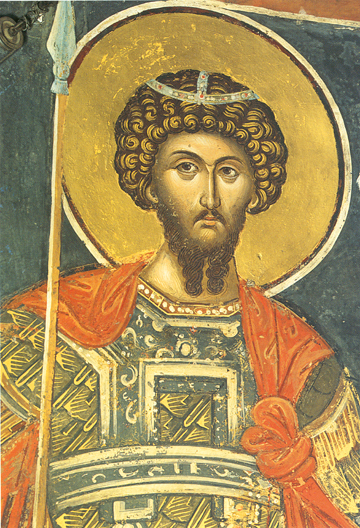 St. Theodore was born in the City of Euchaita in Asia Minor in the late 3rd century. He was handsome and greatly charitable, and for this trait God opened his eyes to the Christian Faith. He killed a serpent that was harming those on the city’s outskirts, and was named the military commander, or general, (Stratelates) of Heraclea Pontica. While he served there, most of the inhabitants of that city turned to the Christian truth and embraced Christ. The Roman Emperor Licinius (emperor from a.d. 307 to 324) began a fierce persecution of Christians. His military commander, Theodore, asked him to come to Heraclea with his idols, and with the idols of Heraclea gathered together, they would sacrifice with all the people. St. Theodore broke up all of the idols and gave away the precious metal in charity to the poor. For this St. Theodore was tortured, beaten, burned, pierced by iron, and then crucified. The next morning he was completely healed by Christ and set free from the cross. Many saw this and came to the Faith. Then St. Theodore calmed the crowd and meekly laid his head before the executioner to be beheaded and come to Christ in 319.